The village of Buckfast, with the Abbey at its core, is not to be confused with Buckfastleigh down the road. 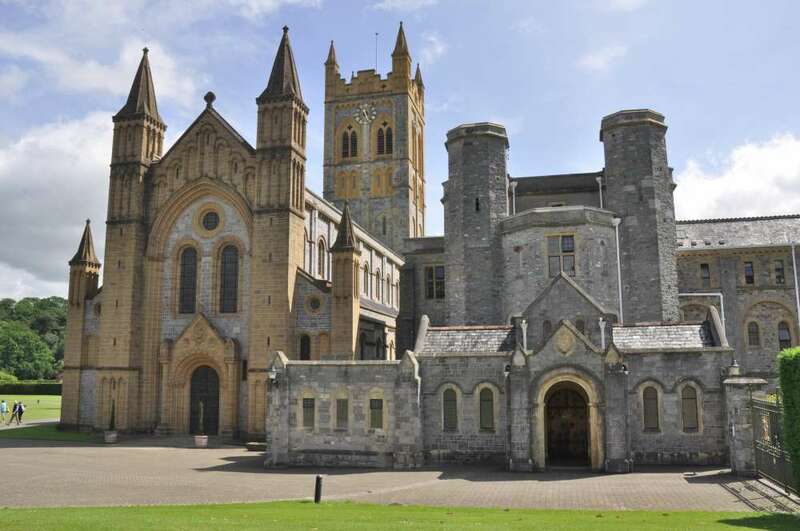 Buckfast Abbey was founded in 1018, closing in 1535 during the Dissolution. The remarkable feature of monastic life at Buckfast is that it was revived again in 1882, when an extensive building programme to restore the Abbey produced much of what we see today. As might be expected, within the Abbey precinct there are a number of distinctive buildings. Part of the C12th outer court is delineated by the North and South Gates (both grade II). Between the Gates lies the early C14th Abbey guesthouse (grade II) built on the foundations of a C12th building and featuring a massive hall. 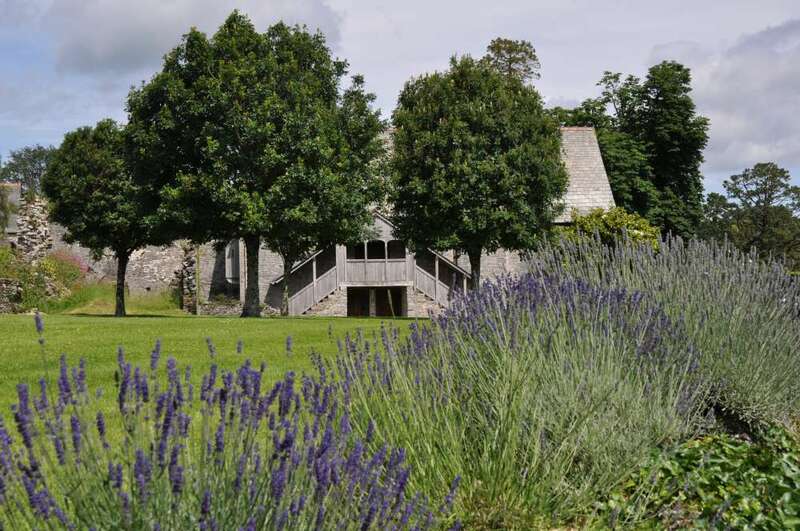 Adjoining at right angles is a wing House at Buckfast Abbey added late C14th/early C15th (also grade II) with store or service rooms below and a seven-bay hall above accessed by external steps on the south side. This group of buildings was adapted after the Dissolution for use as farm buildings and associated domestic accommodation and so survived into the C19th. The remaining monastic buildings were levelled, leaving only the C14th Abbot‘s Tower, when the site was acquired by Samuel Berry in c. 1800. With its octagonal stair turret, the Tower forms the centrepiece of a group of buildings designated grade II* to reflect the importance of this medieval remnant. To the right of the Tower lies the temporary church erected 1882 and to the left a three-storey range, one of four designed by F. A. Walters for the new monastery from 1883. These buildings adjoin a castellated mansion built for Berry that incorporates a medieval barrel-vaulted undercroft. To the south of the Tower, a range of houses built about 1800, is designated grade II. To the north of this complex is the Church of St Mary (grade II*), designed by Walters, and built on the foundations of the medieval abbey building. It was begun in 1907 and consecrated in 1932, built mostly by a small group of monks led by a master mason. This remarkable work was recorded in a series of photographs by one of the monks, and the archive is held by the abbey. The exterior is local grey limestone with Ham Hill dressings, while the interior is Bath stone with red sandstone detailing. The furnishings, floors, painted decoration and stained glass are sumptuous, particularly the metalwork, which is mostly 1928-1932 by Bernhard Witte of Aachen. At the east end has been added a strikingly modern chapel showcasing the mosaic glasswork of Father Charles Norris, one of the Abbey monks. To the west of Buckfast Abbey are remains of the wool industry that once flourished in this area. Higher Mill and adjoining cottages (grade II) make up a complex of late C18th and early C19th buildings, constructed of local limestone rubble and slate-hung on the upper storeys. A long wooden launder running behind the mill carried water from a leat. Such remnants of the wool industry in Devon are rare and this building is stated by Historic England to be ‘one of the earliest and most intact in the county and a significant surviving example’. Further evidence of the wool industry exists at 26-29 Chapel Street, Buckfastleigh, in a row of four cottages with tenter loft for drying cloth, dating from the late C17th/early C18th (grade II). They are a nationally rare example of the pre-factory phase of the industry. Elsewhere in Buckfastleigh, most notably in Fore Street, are many examples of late C18th/early C19th shops with accommodation over, listed grade II. The parish church of Holy Trinity, sited on a high hill between Buckfast and Buckfastleigh, mostly C13th with C15th additions, is listed grade II* but was gutted by fire in 1992. In its graveyard are listed memorials, including the Cabell tomb of c. 1656, and a ruined c. 1300 detached chapel (both grade II*).